Believe it or not, these days savvy business people, as well as smart homeowners, are purchasing portable buildings! Yes, today’s modular buildings can be designed and constructed to fit many purposes. And when you select one of the many pre built portable building office, warehouse of home designs, you will enjoy the luxury of a brick and mortar building while keeping the portability only these buildings allow. Our beautiful pre built buildings allow you to get into your new building quickly and much more economically that a traditional building. But perhaps you are wondering about the different ways these buildings are being used today. One way that portable offices are being used is as faculty space and school classrooms. Many school districts are seeking space for their growing number of students and faculty. School administrators are delighted when their beautiful buildings were quickly erected. They also like the buildings because they blend in beautifully with the other campus buildings. Other companies have used portable buildings because of an ambitious growth plan. They have made arrangements to have new, permanent buildings constructed, but still have an urgent need for additional space right now. They have found both pre built portable building offices and warehouses are the perfect solution for their temporary problem! One of the greatest things about our beautiful modular buildings is the simplicity with which they can be disassembled and moved . They provide the best way for a business to use all its available land without purchasing additional real estate. In fact, many of the companies we work with lease their land. They find no reason to foot the huge bill associated with purchasing commercial property and and then constructing commercial buildings. Because our buildings come as portable building panel kits they can quickly be erected and quickly taken down. This portability makes them perfect for so many different uses. Do you need a building at a venue that will only be used for a short time? Perhaps your business is putting on a trade show, a carnival, or a musical event. If so, your portable building kit can quickly be erected for your event. When the event is over, it can be moved to your next event or stored away until needed. 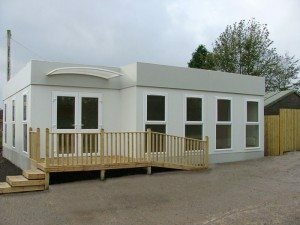 You may be wondering how many pre built portable building office or warehouse designs are available and if there is one that will fit your needs. Be assured that these portable buildings come in a wide assortment of designs and sizes. There is absolutely no question we have the right building for you! Did you know that many people have purchased modular buildings for their permanent or vacation homes? Many customers come to us after purchasing land and want an economical way to build a new home. Our beautiful modular homes come in many unique styles and finishes. There is a design for every purpose and every taste! Often times both businesses and homeowners have their new building constructed on a permanent foundation for long term use. In doing so they saved thousands of dollars over normal construction costs! How you use the building is up to you. It can be set up as a permanent structure that will last for decades to come — or a temporary building that will be moved from place to place. You can even rent your building on a short-term basis. If you have the need for a new building, take the time to come and look at some of our outstanding designs. Purchasing a portable building can provide you with a short-term solution to a temporary space problem, or a money saving way to provide a permanent facility you will occupy for years to come. For more information, click here.